Instead of pumping iron in a hot, windowless basement, moving your equipment to the garage can provide a more inspiring space to get your workout. You can enjoy natural light through garage windows and fresh air when the garage door is up. You’d never know this used to be a garage! This bright space includes living room furniture, a bathroom, and a sleeping loft. If you decide to convert your garage to a tiny house, don’t forget to insulate your garage to keep the warm air contained during our cold northwest winters. In this converted garage, your friends might never want to leave. Fill the space with comfy chairs, table games, a TV to watch your favorite teams, and even a bar if there’s room. During the summer, keep the garage door up for a fun indoor-outdoor space. 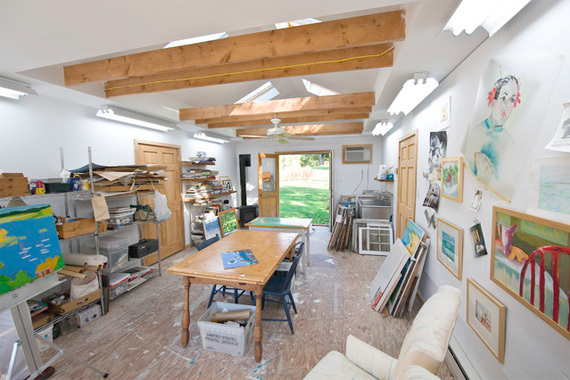 Bring the natural light in by moving your art studio into the garage. You won’t have to worry about ruining your nice floors and can find inspiration from the outdoors. Plus, with the right garage storage, your studio will never feel cluttered. A home office in the garage is more isolated from the rest of the house, so you can get work done with fewer distractions. To make the most of the space, add shelving for storage and skylights for natural light. Consider installing a new garage door to match your stylish new space. When your garage looks this good, you’ll never want to leave. Create an additional living space in your garage with fresh paint, stylish furniture, and comfortable flooring to match the rest of your home. Embrace outdoor living during the summer by extending the room beyond the garage door. All you need is a big screen, sound equipment, and comfy furniture to turn an empty garage into a movie theater. Keep it closed and warm during the winter, or keep the door up to host a summer movie night for your neighbors and friends. These are just a few of the many ways people have repurposed their garages. If you don’t want to commit to an entire makeover, you can also incorporate garage doors into your home with unique designs. Whether you’re looking to redesign your garage or find the perfect garage door to complete your space, contact Larry Myers Garage Doors in Vancouver or Portland today for a free estimate. Our experts are excited to help you create the garage of your dreams.